The shape of the borough of Kensington was likened to a man’s leg and foot in a top-boot, being bordered on the west by Uxbridge Road Station, Addiston Road Station and West Brompton to Chelsea Station; the Brompton Cemetery being the heel, the sole as Fulham Road and Walton Street, and the pointed toe being Hooper’s Court, west of Sloane Street. However, the heart of Kensington is the district gathered around Kensington Square. Until the mid-19th century, Kensington and its neighboring boroughs (Brompton, Knightsbridge, et al) was an outlying hamlet. In the Regency period, Hyde Park Corner was considered the last outpost of safety, and people needing to venture beyond this point traveled in bands for protection. As the district increased in safety, people began to build snug little houses in these quiet “suburbs” and by the 1870s, Kensington was a prosperous area favored by the wealthy upper middle class. However, it was Kensington’s museums and educational facilities which characterized the borough. Not only did it house the Natural History Museum, but the Royal College of Science, the Southern Galleries, which housed various working models of machinery, and the Victoria and Albert Museum. Also in Kensington was Albert Hall, opened by Queen Victoria in 1871 for the performance of music and opera, Alexandra House, for ladies studying art and music, and the Royal College of Music, where students studied (what else?) music and composition. One cannot forget to mention Kensington Gardens and Park (the latter of which was very popular with English nannies and their young charges). Located on the west side of the Serpentine, the palace is associated with Queen Anne, who spent the last years of her reign within its walls, Queen Caroline, who renovated the palace and its gardens to reflect her graceful and lovely taste, and more importantly, Queen Victoria. Her parents, the Duke and Duchess of Lent, moved into Kensington Palace seven months after their marriage in 1818. Victoria was born the following year in late May,but the Duke died less than a year after his daughter’s birth, leaving the new princess most definitely in line for the throne. The power struggle during Victoria’s early years are covered in great detail in The Young Victoria (a very, very excellent film); however, the palace was opened to visitors by the Edwardian era, though the family of Victoria’s favorite daughter Princess Beatrice of Battenberg resided in their own wing, as did Princess Louise, Duchess of Argyll, and a bevy of widows, retired army men, and others who had claim on the private generosity of the Crown. The most striking feature of Kensington was Holland House and its surrounding park. Under the 3rd Baron Holland and his wife, the house was a noted hub of politics, society, and literature, where luminaries of the first half of the 19th century such as Charles Dickens, Lord Byron, and Benjamin Disraeli gathered for wit, glitter, and conversation. In the 1860s and early 1870s, Little Holland House, the dower house situated on the grounds, became the center of a Victorian artistic salon under the aegis of the Prinsep family, but when the lease expired in 1871, the family moved out and the Hollands demolished the building. The manor remained a private residence, and though it continued to be a hub of social influence, attention had long been turned to the lavish mansions of Mayfair and Park Lane. I wonder why the Natural History Museum, Royal College of Science, Southern Galleries, Victoria and Albert Museum, Albert Hall, Alexandra House and Royal College of Music were all built in the one fairly small area. 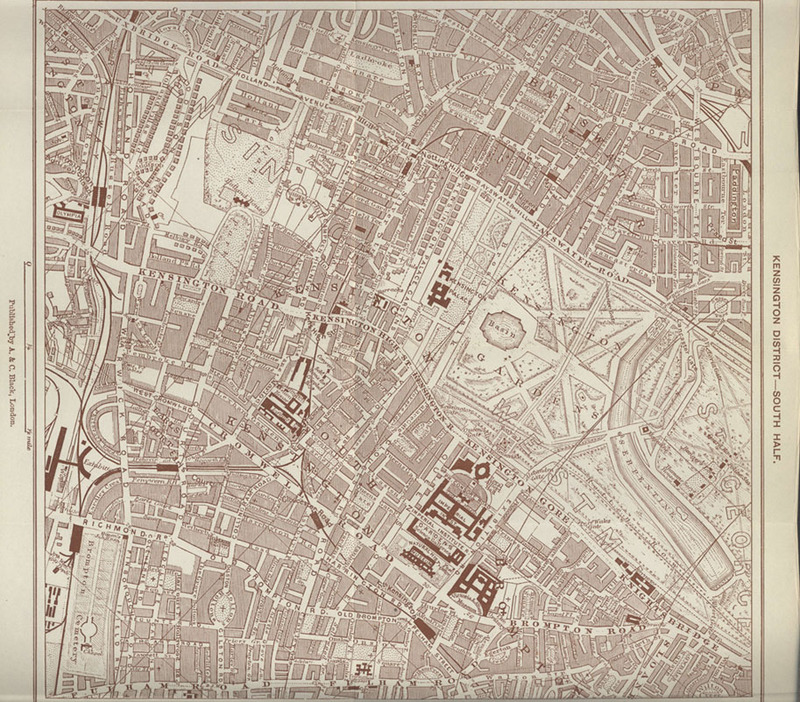 Who would have been responsible for town planning in the mid 19th century? Did they want to upgrade the area and guarantee that the Great Unwashed never ventured into Kensington?